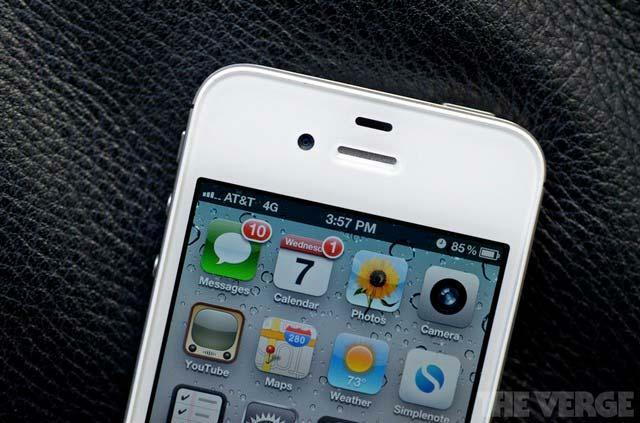 AT&T upgrades iPhone to 4G. Wait, what? In what may amount to the most maniacally audacious marketing decision in AT&T’s storied history of misleading advertising, the wireless carrier has pushed an update embedded deep within Apple’s iOS 5.1 that changes the iPhone 4S’s network display to read “4G.” Reports have been trickling in since the Apple keynote event on Wednesday and we’ve confirmed the update ourselves. To be clear: Nothing has changed about the iPhone’s data speed. Your antennae has not been upgraded by a band of silent and invisible Apple elves to the 4G LTE set found in the new iPad, even though Apple could probably afford to do that. This is plain and simple advertising rhetoric, hyperbole, and outright falsehood. Well, maybe not. If you harken back to the iPhone 4S keynote speech in October of 2011, you’ll remember Phil Schiller offering a very diplomatic assessment of the 4S’s improved wireless capabilities. In describing the iPhone’s 5.8Mbps upload and nearly 15Mbps download speed, Schiller stated that he was “not going to get into a debate about what’s 4G and what isn’t,” according to Macworld. Well it appears that Apple has finally taken a stand on the issue: The only way such a change could have been pushed out via the official OTA update would have been for Apple to send it out from their servers. Sprint and Verizon 4S owners are still reportedly seeing “3G” on their handsets, and in order to modify the firmware in the way AT&T has, the change must have come directly from Cupertino, at AT&T’s request. Which is not to say that AT&T’s 4S isn’t 4G fast: AT&T’s HSPA+ is certifiably the fastest previous generation (read: 3G) network infrastructure currently in existence. It is on par with Verizon Wireless’s current iteration of 4G LTE, which at the time of this writing has an average Speedtest.net aggregate of 14.19Mbps. What is distinctly un-4G about HSPA+, however, is the technical architecture of that wireless network. LTE, which is now the basis of all four major carrier pushes into 4G, is a separate technology from AT&T’s 3G, and at current speeds, represents the absolute bare-bones transfer rate a 4G network should achieve. Built into the LTE spec is the ability to sustain 1Gbits/s speeds — granted, that won’t happen anytime soon with current 4G LTE technologies on any carrier — but it will never happen on AT&T’s 3G HSPA+. Today consumers expect to read between the lines with wireless carrier advertising; the question that really needs to be asked is why a company such as Apple, which extolls simplicity of use to a cultish degree, would go along with something this confusing and innacurate in the first place?